The eMachineShop CAD software automatically selects the most economical process given your design and settings such as tolerances. Almost all choices you make in each dialogue affect price. Choose the lowest cost options where possible – especially in Job | Material, Job Settings and Job | Finishing. Avoid checking Job | Settings | Processes | Secondary Process for Intricate Shapes. See Sharp Inside Corners. Features at edges can sometimes be moved to another view to achieve a sharp corner. Generally using line type Auto will be less expensive than special processes like Injection Molding for short runs. Click Job | Price | Analyze and view the warnings and advisories to resolve as many machine incompatibilities as practical. This allows the system a better chance of using a lower cost process. If you need to apply a finish (powder coat, anodize, plate, etc.) to multiple jobs placed simultaneously, add Comments To Machinist “Apply finishing setup credit for orders placed today.” Your parts will be processed in one batch and the savings passed back to you. Do not assume the lowest price combination you tried a month ago is the lowest price today. The complex pricing mechanism does occasionally make errors – if you have some experience with the cost of custom parts and feel the price quoted might be an error, please submit your design for review. If you imported your design (or part of it) you might find lines made of numerous small line segments. For example, a circle might be comprised of 100 small lines. This can increase price and slow things down substantially. You can determine this by clicking on each line and looking at the status bar. Consider redrawing lines in the eMachineShop CAD so that they are built efficiently. Avoid splines. They can occur when you stretch a shape with arcs. Use the Node edit tool to stretch such shapes to avoid conversions to splines. Sometimes you can save by using pre-shaped stock such as pipe or square tube. For injection molding, minimize use of holes and recesses in the Front, Back, Left and Right views. Minimize the number of views used. Slots and other features at edges can sometimes be moved to another view. End clamp slots with sharp corners instead of arcs. If the design can be done using the Revolve feature try using that method. You can try adding material with positive Z values or removing material with negative Z. For simple revolved parts you can compare using circles and grooves instead of the Revolve feature. You can compare the cost of creating certain features from another view. When possible structure your design to minimize Z values. For example, a rectangular block 1 x 1 x 2″ could be drawn in the Top view with a 1 x 1 square having Z set to 2 or a 1 x 2 rectangle having Z set to 1. The second way will usually result in lower cost. For similar a reason, if you imagine laying down your part on a table, usually you will want to draw the Top view as if looking down on your part. Since parts are machined according to the way they are drawn, it is sometimes possible to draw a part a different way, resulting in a different machining sequence and hence a different price. You can experiment to find the lowest price method. Make sure your parts are really 2D according to the eMachineShop definition of 2D parts. If you have a part that is essentially 2D but needs a few countersinks it may be more economical to specify those 3D features using Comments To Machinist. Remove edge rounding and edge wall angles if possible. For small parts, if 1/16″ fiberglass can be used, ordering a blank circuit board from our Pad2Pad division may be more economical. Try to nest (arrange) parts efficiently to minimize material use. Some shapes nest more efficiently by including an extra rotated copy. For example, a part in the shape of the letter C is more efficient with two C’s arranged so that one copy is rotated 180 degrees and shifted down 50% and a bit to the right. Sometimes parts can be nested to save material. The CAD does not allow nesting fully enclosed shapes however you can add a link with a comment to remove the link. Keep the size of 2D parts under 47.5″ x 23″. IMPORTANT: Also see the general cost reduction tips. In Job | Material, check “Show only recommended materials” – those materials are more often in stock. Reduce the number of finishing steps in Job | Finishing. Minimize use of Comments to Machinist. Click Job | Price | Tips and resolve as many machine incompatibilities as practical. This can allow you to run the job on machines with shorter delivery times. For high quantities consider splitting the job to two orders – a small run with faster delivery and the main run with slower delivery. Can a part 36″ long be machined? Is acrylic compatible with machining? Is aluminum compatible with nickel plating? Can bends be spaced 0.1″ apart? How large a part can be cut? Draw your part or a much simplified version of it. For example, simply drawing a rectangle can determine size limits for a 2D design and adding a simple recess pocket can determine size limits for a 3D design. Take note of any warnings or errors. Note: Warnings shown in Job | Price | Tips do not indicate that your part cannot be manufactured. The incompatibilities listed are only for certain machines – you can proceed with your design. You can get miscellaneous useful information about your design. For example you might want to know the weight of your part. You can view detailed information about any line in your design. For example you might need to check the area of the outermost line. Choose Line | Properties or choose Line | Machine to reveal machine settings. The center of gravity of a part is the point at which the part would be balanced if suspended from that point. You can determine the coordinates of the center of gravity of a 2D part. For example, for a rotating part you might want to check if the center of rotation coincides with a rotation axis. Choose Tools | Compute | Center of Gravity. A cross appears at the center of gravity point. Compute the center of gravity again if you change your design. 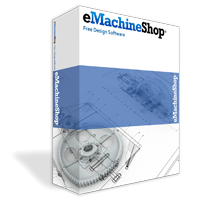 The eMachineShop software is updated periodically to bring you new and improved features, new fabrication options, and corrections. To get the latest version click here. To find out what is new in each release click here. This table shows special keyboard shortcuts that can increase your productivity. You can use the CAD software on a PC that is not connected or has a slow connection to the Internet. Download the software using a PC connected to the Internet. Install the software at your offline PC. Choose Edit | Preferences | Pricing | Price File update method | Indirect. Click OK. Choose Edit | Preferences | Ordering | Indirect. Click OK.
You can use your offline PC to prepare an order file but you will need to update the pricing file before ordering parts. You can send 2D or 3D images of designs created in eMachineShop to co-workers. For example, you might want to send a drawing to a co-worker in another office. Paste the image on the clipboard into your email. If your email program does not allow this, paste into a paint or word processing program, save the file, and attach the file to your email. You can specify to have your parts assembled. For example you might want to specify a PEM insert for a metal enclosure or a hinge for a box. Locate a supplier for any required hardware, adhesives, etc. (e.g. mcmaster.com) and get a price. Affix side panels with mcmaster adhesive #123. Inserts: PEM, Helicoil, Slimserts, Keenserts, etc. (first create the thru or blind hole using the normal CAD interface). Customer is responsible for choosing proper hole dimensions. Existing parts are parts that you purchased off the shelf, taken out of a mechanism, etc. You can have eMachineShop perform additional machining on existing parts. For example, you might need to add some holes to an engine component. You can begin the process using the eMachineShop CAD or your own CAD application. Make an approximate model of the existing part in the eMachineShop CAD. Include the feature to be machined. Use Comments To Machinist to indicate which features are pre-existing; any special requirements; and add “For Quotation Only – Customer to supply parts via UPS”. Click on a blank area of the drawing and then verify that the comment text color is red. Set Job | Settings | General | Quantity to the qty of parts to be supplied. Set Job | Material to the closest material to the parts to be supplied. Place your order (it will be treated as a quotation request only). If you approve the cost, ship your parts to eMachineShop marking the box with the job # from the order confirmation email. Make an approximate model of the existing part in you CAD application or create a hand drawing. In the drawing include the feature to be machined. Use comments to indicate which feature need to be machined and any special requirements. If you approve the cost place your order and ship your parts to eMachineShop at the address shown in the footer of this page, marking the box with the quotation #. You can check if your parts will fit together. For example, you might want to check if a design for a lid will fit on an enclosure you designed. 2. Copy the lines of one part. 3. Paste onto a drawing of another part. 4. Change the copied lines to Comments To Myself. 5. Slide and/or rotate the comment lines into position to check fit. For parts that rotate together, use the rotate feature along with the above method to see how parts fit during rotation. Consider tolerance. For example if Job | Settings shows a tolerance of .005″ and a six inch diameter cylinder must fit a hole you must consider that the cylinder could be as large as 6.005 so the hole must be drawn at at least 6.010 since such a hole could be as small as 6.005. See also the example design in the bending section. If you cannot distinguish the default line colors you can change the colors. Choose Edit | Preferences | Colors. Select a line type in the list. You can print your design on paper. For example, you might want to print to bring a design into a meeting or to hold up the printout to a mating part to check approximate fit. If you have made numerous changes to a design and are concerned about unintended errors, consider redrawing your design. Doing so can result in a cleaner design and may lower the computed price. Print your design for reference. Choose File | New | Blank Design. Recreate the design referring to the printout. 2D (Two-Dimensional) – A part design where the Z value of all internal holes and cutouts are air-inside and no edge effects (rounded edges, chamfered edges, sloped walls, or side grooves) are selected and only one view is used (the Top view). 2D parts with bends are still considered 2D. 3D (Three-Dimensional) – A part design where Z values vary or edge effects (rounded edges, chamfered edges, sloped walls, or side grooves) are selected or more than one view is used. Axis – A principal direction along which the relative movements of a tool or workpiece occur. Three linear axes, occurring at 90° angles from each other, named X, Y and Z.
CAD – (Computer Aided Design) The use of computer applications that allow you to design mechanical parts and other items. CAM – (Computer Aided Manufacturing) The use of computers to assist in manufacturing. CNC – (Computerized Numerical Control) The computer control of machines that fabricate custom parts. Coefficient of friction – The ratio of the friction force to normal force. For example, if it takes 1 lb of force to slide a 10 lb weight along a level surface the coefficient of friction is 0.1. The coefficient depends on the two materials involved. Creep – The deformation of a part over time when under constant stress. Fillet – In mechanical engineering, a fillet is a rounding of an interior or exterior corner of a part design. Friction – Mechanical resistance of motion between two surfaces. G-Code – The industry standard programming language that controls a CNC machine. Galling – A type of wear that occurs because of adhesion between sliding surfaces. Machining Center – Machine tools that are capable of automatically repeating operations such as drilling, reaming, tapping, milling, and boring multiple faces on a workpiece. Machine Tool – A power-driven machine used to form or shape metal and other materials. N/C – Numerical Control – The technique of controlling a machine or process by using programmed command instructions provided by coding. Nudge – The process of moving a line a fixed small distance across the screen using the arrow keys on the keyboard. Pitch – The nominal distance between centers of repetitive shapes. Polyline – A line having several segments. For example, a rectangle is a polyline with four segments. Roughness – A measurable degree of non-smoothness of the surface related to the height of the peaks and valleys. Set Screw – A threaded fastener typically used to lock a sleeve, collar or gear on a shaft. Set screws are normally headless. Set screw points can have various shapes including cups, cones, ovals, flats and more. Shank – The section of a bolt between the head and the threads. Sometimes refers to the section of a cutting tool that is held. Snap – The process of moving one line so it exactly meets a key point on another line. Static friction – The friction between two surfaces having no relative motion. It is the force required to start relative movement. Also known as stiction. Tangent – Two curves or lines that are parallel at the point where they meet. Toolpath – The path that a cutting tool travels to remove material to create a shape. Torque – A measure of twisting force applied to a fastener, shaft or other rotating member. Force is often measured in newton-metres (Nm) or foot-pounds (ft-lb). Tolerance – The acceptable variation in measurement. Z Axis – The third dimension that cannot directly be shown in a flat drawing. The distance out from the drawing towards yourself. Angle of Thread – The angle between the flanks. External Thread – A thread formed on the external surface of a cylinder (e.g. a screw). Flank – The flanks of a thread are the straight sides that connect the crest and the root. Major Diameter – The diameter of an imaginary cylinder that just touches the crests of an external thread or roots of an internal thread. Minor Diameter – The diameter of an imaginary cylinder that just touches the roots of an external thread or crests of an internal thread. Also called Root Diameter. Pitch (threading) – The nominal distance between two adjacent thread roots or crests; or between the centers of other repetitive shapes. Right-Hand Thread – A screw thread that is tightened by rotating clockwise when viewed from the head. Most screws are right handed. Rolled Thread – A thread formed by plastic deformation of a rod instead of cutting. Most fasteners are formed this way. Shoulder Screw – A screw with an unthreaded portion used for more precise and secure locating or as a bearing surface such as in a pulley. UNC/UNRC – Unified National Coarse is a thread form with a 60 degree flank angle, rounded roots and flat crests. The unified thread is based on inch sizes and was first standardised in 1948. It is the most commonly used thread system used in the majority of screws, bolts, and nuts. UNF/UNRF – Unified National Fine is a thread form using a finer pitch than UNC. It is used when a higher tensile strength is needed than the coarse thread series; when smaller length of engagement is needed; when a thinner wall is available; and when instruments and parts require fine adjustments. UNEF/UNREF – Unified National Extra-Fine is a thread form using a finer pitch than UNF. It is used for the same reasons that UNF is used over UNC but for even more stringent requirements. If you need custom mechanical parts machined – eMachineShop can help! Simply download our free CAD software, design your part, get an instant price and click to order. Math functions can be used on the numeric bar in place of fixed values. For example you could enter 3/8 instead of 0.375 or set the length of a line to 3 – 0.15 instead of 2.85.